A bathroom remodel or kitchen remodel are two of the smartest home investments you can make. There are a few benefits that are true for both the kitchen and the bathroom as well as separate reasons you might want to remodel one or the other. Increase your home’s value A bathroom remodel can significantly increase the value of your home. By replacing outdated features with modern and energy efficient baths, toilets, and sinks you can increase the value of your home by several thousand dollars. In addition to getting a higher return on investment, your house will be easier to sell with a new bathroom. 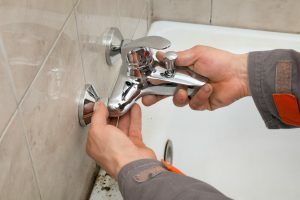 Correct faulty or poorly-designed features Whether it’s a sink that perpetually leaks, cracked tiles, or an old inefficient toilet, a bathroom remodel provides the opportunity to fix unsafe or inefficient features or fixtures in your bathroom. Add more usable space Another major benefit of a bathroom remodel is the space you may be able to gain. A small bathroom can be made to feel more spacious with some clever design tricks. Open up the room, change the layout, and replace older, larger fixtures to enjoy a real change in your bathroom. You can even add additional storage space in your bathroom by using modern design solutions, such as open shelving, versatile cabinets, storage racks and wall storage. Make your home more energy efficient Energy efficient or green homes are in high demand these days. The Environmental Protection Agency estimates that about 10% of US homeowners have recently upgraded their bathrooms with energy-efficient appliances and fixtures. That translates into savings of $1.5 billion worth of energy costs and 70 billion gallons of water nationwide. Add luxury A bathroom remodel gives you the opportunity to add a little luxury to your life. There are numerous options available in touch screen mirrors, innovative sinks, and dramatic lighting. You can even watch your favorite TV show while relaxing in a Jacuzzi tub or enjoy a warm toilet seat or towel rack during the cold winter nights. The possibilities are endless. It’s worth repeating that both a kitchen remodel and bathroom remodel offer one very large benefit — increased value to your home. Your home will be worth much more if it has a new, modern kitchen and bathroom. One of the first things potential homeowners consider is how much work they’ll have to do if they buy your home. If they see a 1980’s kitchen, they see dollar signs for repairing and remodeling. However if they see a modern kitchen not only are they happier, they know that while you lived in the home you had pride of ownership. If you’re ready for a life-changing bathroom remodel, give us a call at Pilgrim Plumbing and Heating – we’re the area’s experts in kitchen and bath remodeling.